T.E.A.L.® is excited to announce the funding of Ovarian Cancer Institute’s Validation of 100% Early Diagnostic Test. 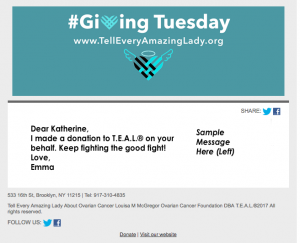 The Ovarian Cancer Institute is on it’s way to validating an accurate early stage diagnostic test and T.E.A.L.® is proud to be a funder of this crucial test. Early diagnosis of ovarian cancer results in a 92% chance of surviving longer than 5 years after diagnosis and unfortunately less than 15% of ovarian cancer cases are diagnosed in the early stages. We have hope that an early diagnostic test that is given at a women’s annual check up will one day help save lives! The Ovarian Cancer Institute is located in Georgia just a few hours north of Savannah, which is home to our Savannah T.E.A.L.® Walks! The Ovarian Cancer Institute’s mission focuses on “developing innovative research leading to earlier detection and more effective control of ovarian cancer; to investigate newer models of treatment; and to heighten women’s awareness of the symptoms of, and treatment options for, this disease.” T.E.A.L.® is so proud to take part in this amazing, life saving, discovery!